The American Legislative Exchange Council became the nation’s best-known “model”-bill factory over its four decades by providing more than fill-in-the-blank legislation. The networking takes place at ALEC’s annual meetings, where the group fetes and entertains lawmakers and their families. Relationships are forged over drinks and dinners, where lawmakers sit alongside conservative luminaries and corporate chiefs. Bills based on ALEC models were introduced nearly 2,900 times, in all 50 states and the U.S. Congress, from 2010 through 2018, with more than 600 becoming law, the USA TODAY and Arizona Republic analysis found. Among groups that produce fill-in-the-blank legislation, ALEC’s influence was second only to the Council of State Governments, a nonpartisan group that provides state governments with research and guidance on policy. CSG saw more than 4,300 bills based on its models introduced, and 950 become law, according to the analysis. Today, private-sector members pay at least $12,000 to join, with some paying much more depending on the level of access they seek, said Bill Meierling, ALEC’s chief marketing officer and executive vice president. Lawmakers, meanwhile, pay $100 for a two-year membership and can solicit donations to cover the cost of attending annual meetings, depending on rules in their state. They can also apply to ALEC for travel reimbursements, Meierling said, which ALEC funds through additional corporate donations. While ALEC encourages families to participate, it only reimburses lawmakers’ conference costs, he said. Lisa Graves, co-director of Documented Investigations, which probes corporate manipulation of public policy, said corporations and corporate lobbyists’ see a big return on their investments in ALEC. It’s often much cheaper than coordinated campaign contributions or direct lobbying and can have a much bigger impact, she said. Meierling said only legislators can introduce ideas for model legislation. If the task force approves their idea, it then goes to ALEC’s board. 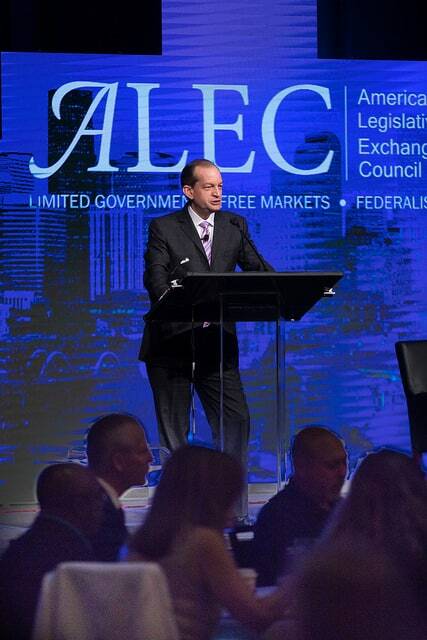 Made up solely of lawmakers, the ALEC board has the final say on what becomes model legislation, he said. Legislative staff — including those whose job it is to write bills for lawmakers — attend ALEC’s conferences too. The Arizona House of Representatives, where Republicans have held the majority for decades, spent $10,000 to send six staffers to ALEC’s 2017 conference in Denver. Arizona introduced at least 209 bills copied from ALEC models, 57 of which became law. Only one other state, Mississippi, debated and passed more ALEC models, according to USA TODAY‘s analysis. Joe Walsh, a former data scientist at the University of Chicago who has tracked the spread of model legislation, said legislative staffers naturally look for fill-in-the-blank bills from groups aligned with the prevailing ideology in that statehouse. The incident focused outrage on the use of model legislation, as well as ALEC, whose low profile had been key to its success. 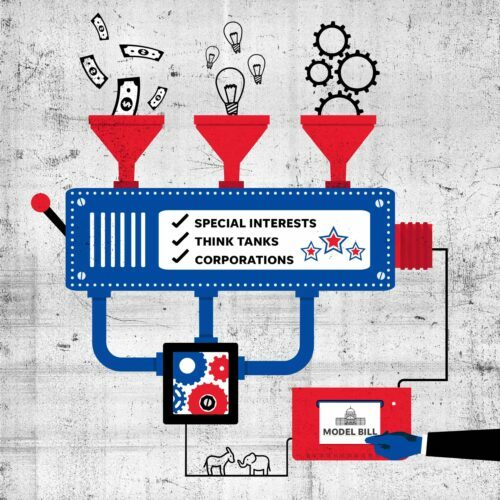 Liberal critics publicized ALEC’s corporate members and its methods for spreading policy. An avalanche of companies cut ties with ALEC, including Walmart, Procter & Gamble Co., Coca-Cola Co., Kraft Foods, McDonald’s Corp., and the Bill & Melinda Gates Foundation. “Every five years, we actually go through everything to make sure that we are updating things for the times or, more often than not, sunsetting policies that no longer make any sense,” Meierling said. Among the top donors to Lesko’s congressional campaign, according to opensecrets.org, were four companies with ties to ALEC.